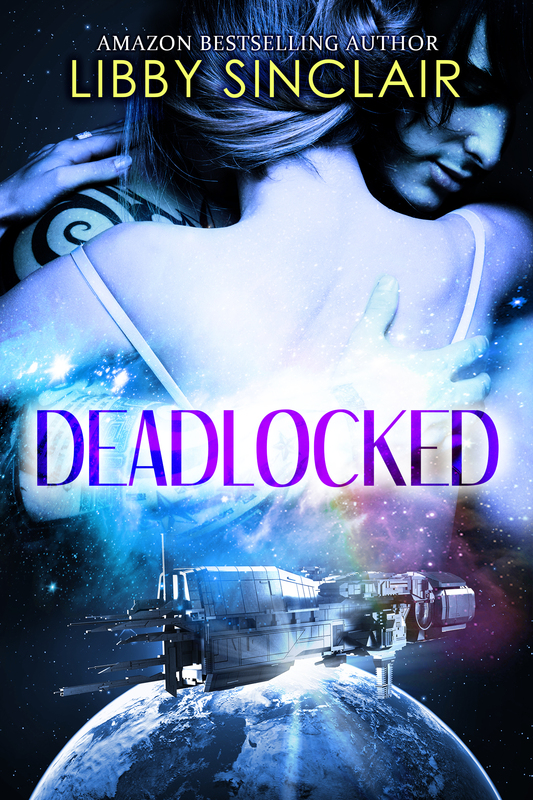 Happy book birthday to Libby Sinclair and her Deadlocked! As a special treat we’re going from Lea’s blue men to Libby’s green. Alien diversity, right? I think I’m developing a thing for starkly colored aliens. Especially ones who think like Finn does in the excerpt below. Brielle frowned and strode past him to take stock of the beds; several thermal blankets and head cushions, a shelf of surgical gowns, slippers. Nothing of use. “Nothing.” She opened the first set of cabinet doors; empty. Finn’s brows shot up; his eyes searched her face. Brielle pressed her jaw shut to keep from responding. Haakon didn’t deserve any more of her consideration. He chose his side when he instructed the medic to remove her tracker. The lights flicked off. A crack sounded and the room filled with a green glow as Finn activated a glow stick. “Would you rather be left in the dark? It works and it’s reliable.” He spun the glow stick in his hand, the light accenting his sea green skin. “A couple hours.” He set the glow stick on a stainless steel medical tray, amplifying the light. This wasn’t how Brielle thought she’d die. Old age was never in the cards for her line of work, but she’d thought she’d die of something a little more glorious than hypothermia. A death in battle perhaps. Hopefully, in the line of duty beside her fellow Cavaliers. “Perhaps if we build a shelter with the thermal blankets…” She pulled the mattresses off the two closest beds and kicked them into the corner of the room, then threw some blankets on top. Finn let his arms drop to his sides, then approached. She had never seen his gaze so intense. She took a step back, her rear end hitting the medical bed frame. “What are you doing?” She drew her blaster and pressed it against his chin again as he pushed himself against her. He leaned in, his hands cupping her cheeks, and locked his lips to hers. Her blaster dipped as heat washed over her from the caress of his mouth. Her fear fell away, replaced with something else. Long repressed desire ebbed from her belly and flooded her chest. She shook herself and reasserted her threat. “I’m not afraid to use this.” She pushed him back with the barrel of her weapon, her breath heaving from her chest. Brielle couldn’t deny it. But she sure as hell tried. The question was why? “No.” She had been with Haakon so long she couldn’t remember the names of her other lovers. Haakon had been safe and predictable. The easy choice. ABOUT LIBBY: Libby Sinclair is a fictionist and has been writing for the last ten years. Inspired byStar Trek, Star Wars, Battlestar Galactica,Voltron, and Mass Effect, Libby mixes lots of action, a little science, and plenty of hot, steamy love to bring your one of a kind science fiction romance. She is happily married and although her husband doesn’t understand her fiction habit, he accepts it. This entry was posted in Books Blog and tagged #sfr, #sfrb, Alien Romance, Romance. Bookmark the permalink.